There are many reasons why homeowners choose to renovate. The idea could spring from outdated appliances in the kitchen or warped flooring in a den. Sometimes the décor needs a makeover. No matter the circumstances, a home redo is an opportune time to integrate technology. Consider this: According to a smart home study by Houzz, Nearly half of homeowners are installing smart systems or devices during their renovation projects (45%), with the average renovating homeowner adding one smart system or device to the home in the course of a renovation. The team at Tampa Bay Electronic Systems (TBES) capitalized on this trend recently by installing more than a dozen Somfy shading motors into a new home addition. Because the addition would feature several huge windows, shading the home environment from the hot Florida sun was crucial to the comfort of the homeowners. It would be easy for TBES to run wiring during the construction of the new upper-level bonus room, but difficult in the finished existing first level. Somfy, which Nichols refers to as his “go-to” manufacturer for shading motors, had a solution for both the old and new portions of the house. TBES installed 11 hardwired Sonesse® 30 RS485 DC hardwired motors for the window shades in the new addition and two ultra-quiet Sonesse ULTRA 50 RTS wireless motors with 24V DC power supplies for two huge shades in the existing main level. “Without the addition of the shades on the second-floor, the media system would have been unusable due to sunlight. Somfy and TBES collaborated with Universal Window Coverings to fabricate the coverings for the motors. to house two Somfy motorized shades. The two wireless motorized shades were installed above the newly constructed ceiling to house two 6-foot-wide-by-11-foot-high shading fabrics that would function as a room divider. 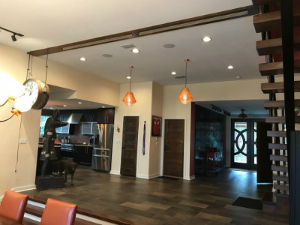 “We worked with the builder while the ceiling was exposed to create a removable wooden panel with a thin nearly imperceptible slit through which the shade could move through freely,” Nichols explains. From its casing above the ceiling, the shade drops 11 feet to divide the dining room from a dance hall. “The owners are able to host an intimate dinner with the shade down then invite guests into the dance room by raising the shade,” Nichols continues. 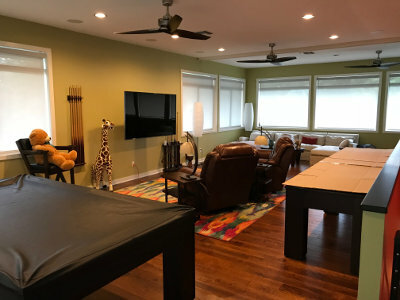 TBES integrated the hardwired and wireless motors with the home’s existing Control4 system, which the owners were using for control of their A/V equipment. “The owners were already familiar with Control4, and Somfy integrates easily with it, making this installation easy for us and a huge hit for the homeowners,” Nichols says. TBES added a Control4 keypad at the entrance of the new bonus room; the owners use an existing portable touchscreen to operate the room divider in the lower level. They can also use a handheld remote or mobile app. Thanks to a wide variety of motors, innovative design, and compatibility with many top-name home control systems, Somfy provided TBES with all the tools it needed to make a new addition comfortable and breathe new life into an existing part of a house. 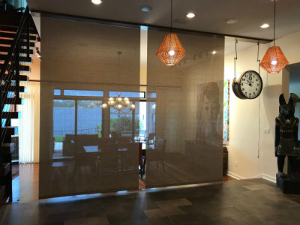 Add the fact that the homeowners were able to select from a wide variety of window covering styles and fabrics, not limited by compatibility with other systems, and finding a solution for their unique needs was straightforward and uncomplicated. Through clever design, engineering and integration, Somfy and TBES were able to deliver the ideal shading solution. This article was originally published at CEPro on 08/09/2018. It was added to IoTplaybook or last modified on 08/09/2018.